Artists used the Mini's space to create new brand campaign. Every once in a while it’s nice to be reminded that the grandest things can arrive in seemingly small packages. Today, Mini USA launched a unique campaign to prove that when it comes to big scale adventures, their latest Mini model is more than up for the task. 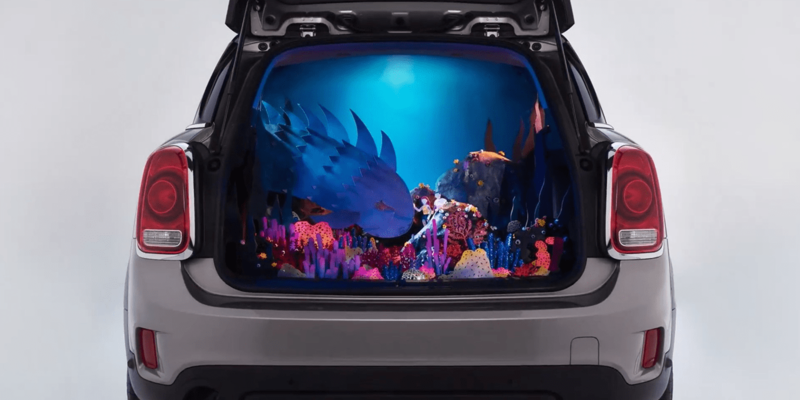 “Created in a Countryman” is a creative collaboration with the brand’s digital advertising agency 360i that highlights the versatile cargo space of the 2019 Mini Countryman. Straying away from the formulaic simulated action scene that many would come to expect with an objective such as this, the automaker tapped stop-motion animator Kirsten Lepore (the mind behind the delightfully awkward “hi stranger” viral short) and diorama duo Nix + Gerber to create two short films celebrating the possibilities of the generous trunk space. The projects came with an interesting twist: the artist had to create and film the entirety of their masterpieces within the Mini Countryman’s cargo space. And both films certainly delivered. Lepore’s stop-motion short “Underwater” explores the vibrant floor of the ocean—intricately designed with construction paper, toothpicks, skewers, and plexiglass—alongside a diving couple. During their rather romantic, aquatic voyage they are confronted by an intimidating sea creature who turns out to be a gentle giant. “This campaign intends to demonstrate how the Mini Countryman offers the space and versatility to handle even the biggest adventures,” said Patrick McKenna, department head of Mini Brand Communications. Both shorts will be available throughout many digital platforms, including Mini USA’s YouTube channel.